Ahhh… the simpler times. Before 2 more channels than you actually need, before the veritable explosion in a knob factory and before laptops was the ever so simple 2 channel mixer. You remember don’t you? When DJing was simply about mixing track 1 into track 2 and then back again? Oh you don’t? You missed some good times. More or less every manufacturer has thrown themselves head first into the digital pool. Some have done well, while others didn’t even check to see where the bottom was. 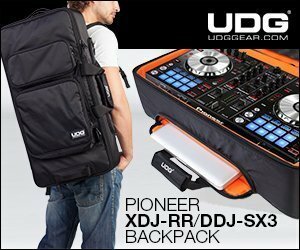 One such company is DJ Tech. Their intention was good, and indeed did put out some hugely underrated pieces. But the now infamous DJ Mouse pushed them over the edge into comedy irrelevance. Things had to change, and change they did. The DIF 1-S made its official first outing at NAMM 2013. And despite the overwhelming mass of heavy metal boxes with all manner of cool stuff scooped inside, this very simple almost retro mixer got a lot of attention, including that of scratch legend DJ Qbert who gushed at length about it — quite a feat for a seemingly irrelevant company pushing out a possibly irrelevant product. The DIF-1S takes DJing right back to basics, but with the benefits of the modern age. This is a very simple 2 channel mixer with just enough to service the core needs of most DJs. The spec list is short – 2 channels, 3 band EQ with gain, mic input, dual headphones, channel and master meters etc, but it’s some of the newer features that makes the DIF-1S most interesting.The inclusion of a Mini Innofader and dedicated DVS inputs are digital age additions. Let’s go through it all feature by feature. Small, heavy and strong. Indeed, this is quite a small but sturdy block of metal, and indeed there’s a lot of it too. Firstly the size – this is a 9″ mixer, thus a little smaller than your regular 10″ scratch mixer which lends to the overall sturdy feel. It’s just under 12″ deep as well, and has the nice side effect of allowing decks placed in battle position to not need right-angled RCA cables. It is a little higher than the standard by about 10mm, but in use it didn’t prove to be an issue. The build is nothing short of stellar. The full metal case houses a metal subframe, which in turn has all metal pots nutted to it. This is the kind of thing you’d expect to find in Rane mixers, not some super cheap far eastern factory unit. Much is made of plastic pots and their durability, so to see and feel the solidity of these controls fills me with good vibes. The buttons are a bit iffy, as are the switches, but they work. The faceplate is also ridiculously meaty, and being symmetrical offers scope for flipping it over and customising it. Another plus is the built-in switching power supply. Sounds like nothing, but it’s one less flimsy wall wart to contend with. And IEC leads are considerably more robust. The layout follows the tried and tested workflows that have evolved over many years and offer little in the way of surprises. But despite the smaller frame, the layout is still nice and open. Nothing feels crammed in, and for scratch DJs, the fader area is very open indeed. So I’m putting great big ticks in the quality and layout boxes. Let’s see if everything else is up to muster. When the DIF-1S was first shown, it had the honour of being the mixer to be announced that used Audio Innovate‘s long awaited mini Innofader. 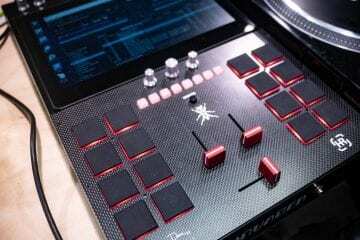 This had been created to cater for the growing controller market, which generally have little space to add in long bodied faders. But it seems that mixers are getting the first dibs on this, if only because the fader is likely to outlast the shelf life of today’s average controller. The mini Innofader is an off-the-shelf unit heavily tweaked to Audio Innovate’s exacting standards to give the very best performance from a short bodied fader. No easy task, but AI have managed to to a sterling job of making the fader extremely smooth, nicely weighted, and if the specs are anything to go by, long lasting. But this isn’t just a scaled down Innofader. Some compromises have been made along the way, but not many. There is a reverse and curve control on the face plate, and you can also calibrate the mini Innofader to manually set the cut-in distance on both sides of the fader. You’ll need to take it out to do it, but it’s as easy as moving the fader stem to the left and right and pressing the calibrate button on the underside of the fader. The line faders however are nothing special and lack curves, reverses and cut in adjusts, but are perfectly acceptable regular short bodied Alphas that are found almost universally across the mixer world, including scratch mixers. The really good news is that all 3 faders can be swapped out for full sized PNP Innofaders. 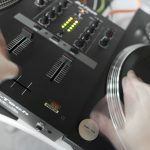 No word yet on retail mini Innofaders, which I suspect would make more sense than shelling out for individual full sized Innofaders that cost more than your mixer. On a related note, if you already own a Pro X Fade, it should fit right into the crossfader slot as it’s a regular 4 pin connector. I’ll be getting word on the line faders soon, as for some reason they’re 5 pin connectors. Had the DIF-1S just come with regular Alpha faders throughout, I’m not sure it would have even have registered on the radar. So it’s a very astute move from DJ Tech to add the mini Innofader as standard. And we thoroughly approve. Being sat firmly in the entry level category, I had zero expectations of how this would sound or perform. And neither should anyone else either. Each channel has the regulation 3 band EQ – they don’t kill (normally a prerequisite for scratching), but do go far enough to all but remove the bass rumble. Monitoring is handled via a short set of LEDs and are switchable between channel and master. It’s interesting that I found it impossible to run it in the Red. Yes you can crank everything to full and have it spend more time in the Red, but it’s your ears that will tell you off before the meters do. One real shortcoming in my book is the inability to master cue. For people wanting to mix or scratch in the headphones… well you can’t directly. There is a workaround that I cover in the next section though. This is where the DIF-1S delivers one of its key features. As a 2 channel mixer, it has the requisite RCA ins and outs with rear switchable line/phono as well as a separate line input per channel. But where things get really interesting is with the dedicated timecode channel. Each channel has the regular phono and line switches, but there is also a 3rd position with corresponding RCAs on the rear of the DIF-1s. These connections are labeled SEND and RETURN. Simply hook your DVS interface up to these (Send to inputs, and Return to outputs) and that’s your DVS hooked up. This still leaves you free to switch between connected line and phono devices as well. The real bonus is being able to pretty easily switch between DVS devices, and switch each channel out one at a time without interruption. 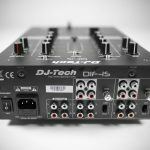 Because the turntables stay connected to the mixer’s phono inputs, you get full flexibility as to what is connected at any one time, including having 2 different DVSs connected to separate channels at once. This isn’t exactly new – the Vestax 05 Pro 4 has much the same thing. But in a £99 mixer, this is amazing. Rounding things off are a single mic TRS port and minijack and 1/4″ headphone jacks, both with corresponding volume controls on the faceplate. But as ever, with such a price tag comes some compromises. Master output is via unbalanced RCA only. For the target market, this shouldn’t really be an issue, and most monitors have an RCA input on them too. The strange decision is the inclusion of booth outputs. In essence it’s just a second master output that appears to be at the same level, allowing you to hook up to a secondary source e.g. for recording. This booth output does come in useful as a workaround for one of the DIF-1S’s failings. As mentioned before, there is no master cue, so you can’t scratch in your headphones. But you can however hang a Y cable out of the back of the booth and plug your headphones in there. It’s not ideal as you have to switch your headphones in and out. But it does work. I was groping for a reasonable idiom other than “let’s see if this is up to scratch”, but it seems like the perfect verbiage to use in this instance. 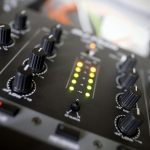 Before judging the DIF-1S, it’s important to factor in the focus and cost — the DIF-1s has no pretensions of being a £500 MIDI-laden übermixer with built-in audio interface. It ‘s unashamedly a cheap scratch mixer, and that’s how I’m judging it. And so should you. Out of the box, this is a super simple plug and play affair. Hook up your decks, twist that curve control all the way round and you’re in scratch heaven. The more accomplished amongst you will miss curves on the line faders, but for straight cutting, the DIF-1S… cuts it. 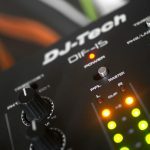 From a DVS perspective, being able to leave your decks plugged into the mixer is very useful and allows for a simpler wiring setup. The crossfader itself is very smooth and free-flowing. There is quite a hollow thud from the unit if you’re using it at low volume, but nothing too annoying. The cut-in distance is around 1.5mm with a very slight curve remaining, but nothing that effects pulling off crabs and other click-happy techniques. In practice, pulling the mini Innofader out to attempt recalibration resulted in no improvement. Out of the box is as tight as it’s going to get. Sounding like a broken record but feeling the need to underline this, we’re talking about a £99 mixer. For the money, it performs way better than it should. 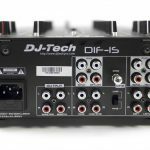 Given that the DIF-1s is a £99 mixer, it punches way above its weight and should see itself becoming a fairly standard fitment in many turntablist’s setups. It’s such a joy to be faced with something quite simple, that harks back to the days before MIDI and buttons and all that other stuff that the digital age brought with it. You plug in your decks and you’re off, just like it should be. The utter simplicity of the DIF-1s makes it a joy to use — no having to learn arcane buttons, no mapping of controls that you probably could do without. This is real back to basics stuff, and on the whole the DIF-1S does those basics incredibly well. Some will look at this mixer and lament what is doesn’t do. It has no MIDI, no curves or reverses on the lines, no master cue, no audio interface etc. 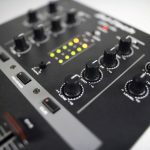 But this is an extremely well built mixer with a killer crossfader and DVS channels – and costs just £99. Look at what it does rather than what you perceive to be missing. Because for the target market, the DIF-1S is an absolute bargain. Quality — Built like a tank. Not just from a budget mixer sense, but from even an expensive product sense. The mini Innofader is the icing on the already tasty cake. Features — Judged simply on what it sets out to do, it’s really good. The decision of adding a booth output but not master cue is a bit odd, but a workaround exists. Value — Outstanding. Shut up and take my money. 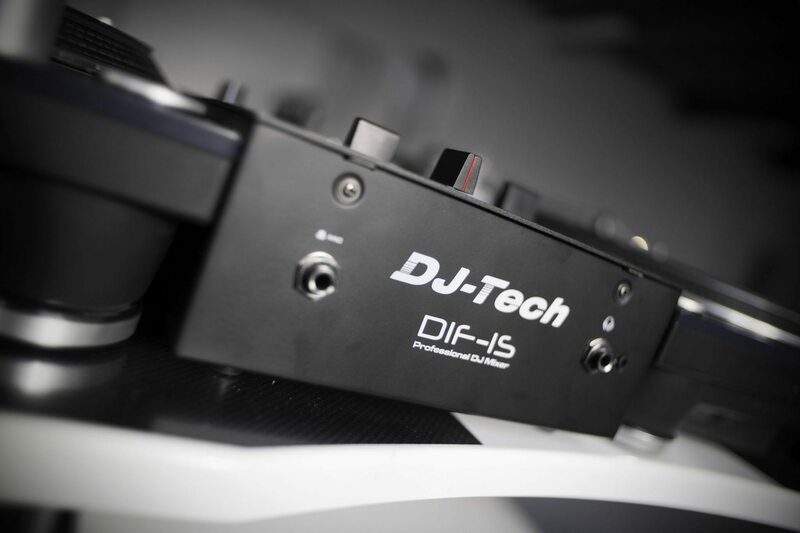 With the DIF-1S, DJ Tech have created the new entry level scratch mixer standard. If that’s your bag, buy one today.